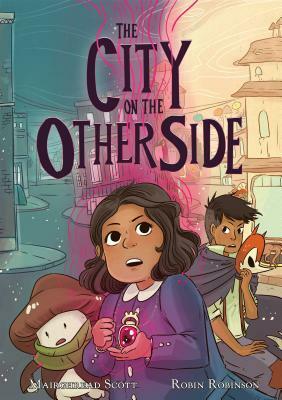 In The City on the Other Side, a young girl stumbles into a pitched war between two fairy kingdoms, and the fate of San Francisco itself hangs in the balance! Sheltered within her high-society world, Isabel plays the part of a perfectly proper little girl—she’s quiet, well-behaved, and she keeps her dresses spotlessly clean. She’s certainly not the kind of girl who goes on adventures. But that all changes when Isabel breaches an invisible barrier and steps into another world. She discovers a city not unlike her own, but magical and dangerous. Here, war rages between the fairies of the Seelie and Unseelie Courts. Only Isabel, with the help of a magical necklace and a few new friends, stands a chance of ending the war before it destroys the fairy world, and her own. From Mairghread Scott and Robin Robinson comes a colorful fantasy graphic novel set in early twentieth century San Francisco. Mairghread Scott is an animation and comic book writer. Her animation includes Marvel’s Guardians of the Galaxy, Ultimate Spider-Man: Web Warriors, and more. Her published books include Marvel Universe Guardians of the Galaxy, Transformers: Till All Are One, Transformers: Windblade, and Wonder Woman 75th Anniversary Special #1. As well as her graphic novels with First Secoond, The City on the Other Side and Science Comics: Robots and Drones. Robin Robinson draws books for both kids & adults, and has always identified with the ghosts and fairies and monsters in stories. With a background in game art as well as picture book illustration and a life-long love of comics and animation, she has found a way to artistically nerd out in all her favorite media. Robin tries to live every day like its Halloween. She illustrated Mairghread Scott's The City on the Other Side and an adaptation of The Wonderful Wizard of Oz.